This High Spec 7 Seat Pathfinder Has a Powerful 2.5 Litre Diesel Engine with 4 Wheel Drive and Fantastic Off-Road & Towing Ability. Generously Equipped with Full Graphite Grey Leather Interior, Heated Electric Seats, Satellite Navigation, Bluetooth Connectivity, DAB Radio, 18 Inch Alloy Wheels, Front and Rear Park Distance Control with Reverse Camera, Factory Fitted Side Steps, Leather Multi Function Steering Wheel, Cruise Control, Towbar with Electrics, Electric Sunroof, Heated Electric Powerfold Mirrors, Roof Rails, ASR Traction Control, Auto Dimming Rear View Mirror, Automatic Headlights and Automatic Rain Sensing Wipers. 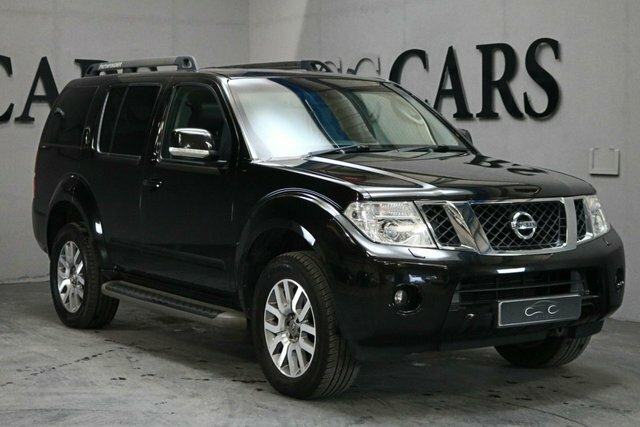 We have an excellent selection of used cars from popular producers here at CC Cars Limited, like Nissan. Nissan is an innovator in numerous automotive market segments. The Japanese vehicle maker is often renowned for conceiving the idea of the crossover with the Qashqai and Juke, and the Leaf is one of the most popular completely electric vehicles available. There is certain to be a perfect Nissan model for you, and where better to get it than CC Cars Limited? Quality and value are our top priorities. Find your next Nissan vehicle on our forecourt in Dukinfield, not far from Stockport.